Isomeric Alcohol Ethoxylates is made from C13-Guerbet and Ethylene Oxide which own great emulsion, wetting , degreasing properties and good compatibility with other additives and degradability. They are widely used in many industries, such as detergent, textile, electroplating, painting and architecture. 1.They have excellent refining effect with a little amount in pretreatment formula. 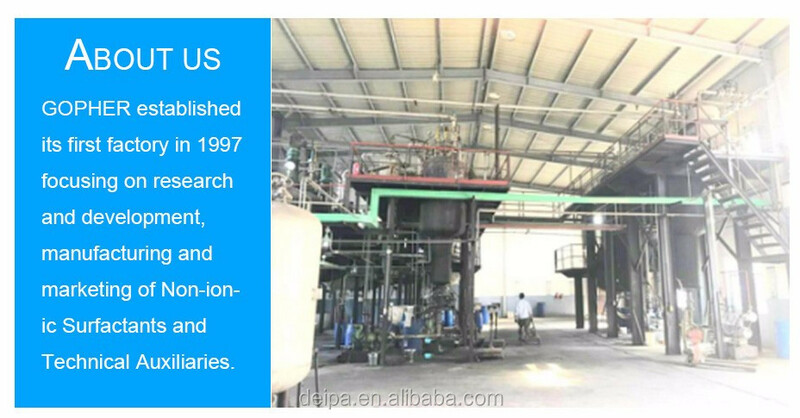 2.In the textile chemical industry and leather chemical industry, the product is used as degreasant, detergent, emulsifier and refining agent. 3.The products have good performance in emulsifier and penetrating ability, especially for silicone oil emulsifier agent. It can get better emulsifying effect for amino silicon oil and dimethyl silicon oil. 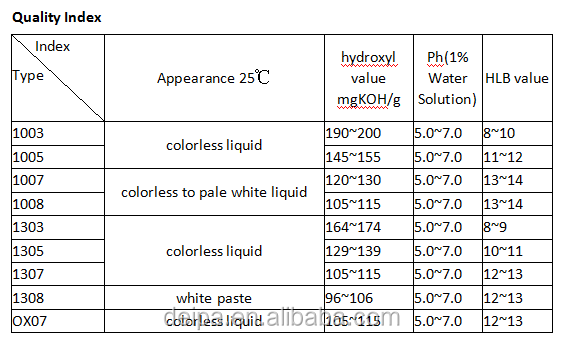 .For good performance in emulsifier and penetrating ability, the product is widely used in metal processing auxiliaries, multi-function detergent, solubilizer, home care cleaner and etc. 4. Used as excellent emulsifier, it can be raw material of solvent-based cleaning agent and auxiliaries in emulsion polymerization. With good performance of penetration, it can infiltrate into interior of the fiber and make the fabric softer. 5. The series of products do not contain APEO, thus they can be called ecological friendly products. Are We Manufacturer or Trading Company? We are manufacturer with 17 years' experience in creating high quality chemical raw material and ensuring our buyers to get what they want without any delay. Our own factory locates in Hangzhou,China. In 2012, we established our new trading company Gopher Chem Technology specialized in R&D of DEIPA (Diethanolisopropanolamine) for our global partners. We have a passionate and creative team firmly believe that 'Only Focus Can Create the Best Quality Products',it's why our factory is able to survive and thrive since 1997 in this competitive Chinese market. How about Our R&D capability? As we have long-term cooperation relationship with Top Universities in China,such as Zhejiang University(Ranks TOP 3 in China),our scientific research and development on products are always on the cutting edge. With such powerful R&D support, we are able to customize our products and services according to your requirements. Worrying About Wasting Time on Shipment-related Formalities? Our team members have more than 10 years' experience in international trading, we will always guarantee your shipment being prepared timely and shipped to the destination safely. How to Prove What We Are Saying is True? Yes, We believe in facts as you do, so no matter how nice the talk is, good product speaks for itself. Hangzhou Gopher Chem-Tech Co., Ltd. The supplier is ranked number 19 by responses data in Other Chemicals.